One of the world's most recognized vegan bodybuilders presents a comprehensive guide to building a strong body while eating a vegan, plant-based diet. Author Robert Cheeke inspires people to sculpt magnificent physiques. His passion for doing the most amount of good while causing the least amount of harm has inspired athletes, trainers, and anyone interested in a strong, healthy body. 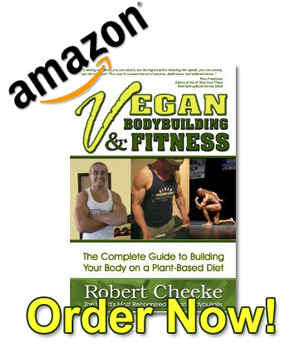 This title includes information on the most important things to consider in order to be a successful vegan bodybuilder including the best way to put together vegan meal programs and training regimens, how to find sponsorship and make bodybuilding a career, and where to find access to vegan products, services, and equipment. There is also advice on how to take bodybuilding beyond a personal endeavor and use it for activism and outreach. Support Robert. Support the cause. Help make “Vegan Bodybuilding and Fitness” an Amazon best-seller!